Just a few days back the Nexus 5 was spotted in red colour and now the press renders of the device in red have been leaked, thus confirming the colour variants. According to the image leaked by popular tipster, the Nexus 5 smartphone is seen wearing bright red colour. Sources believe that the device in that colour variant is expected to be released on February 4. While Google is yet to confirm the red colour Nexus 5, it would be a welcome addition besides the existing black and white devices. If this news turns out to be true, we can also expect a yellow coloured Nexus 5 to follow soon. 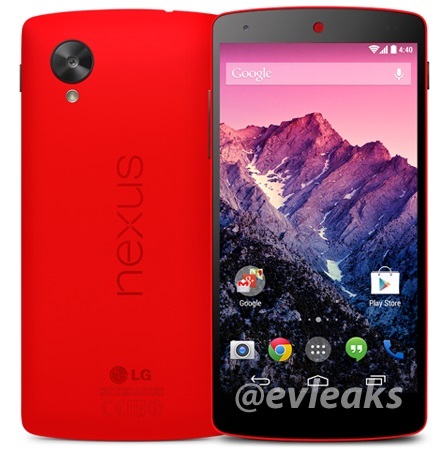 However considering the press render being leaked, we can say that at least the Red Nexus 5 rumour is true. A variety of bright colour options would definitely help Google promote the Nexus 5.